The results of an annual survey of which airlines are the best when it comes to using your frequent flier miles show value-oriented carriers continue to lead the pack, but also showed some surprising improvements among larger carriers. According to the 2014 Switchfly Reward Seat Availability Survey released May 8, Southwest Airlines (NYSE:LUV) and airberlin tied for first place for their passengers' ability to book a "saver" seat using accrued frequent flier miles. Both airlines offered seats on 100% of their flights for the test period queried. The two carriers have ranked at or near the top of the survey since its inception in 2010. The fifth annual survey, conducted in March by a company called IdeaWorks, is based on 7,640 booking queries made by the company at the websites of 25 frequent flier programs. Travel dates spanned June through October 2014, with top routes for each carrier checked to assess "saver style" reward seat availability. The company then recorded whether reward seats were available for both outbound and return travel on the dates specified. Among the surprises in this year's results are improvements in reward seat availability on major network carriers, even as sweeping changes across loyalty programs affect their most loyal passengers. "This is certainly good news but it will remain incumbent on travelers to search for redemptions that capture the greatest value as airlines continue the sea-change toward operating their loyalty programs as profit centers," Daniel Farrar, Switchfly CEO, said in the news release announcing the survey results. Delta Air Lines (NYSE:DAL), which shook up the loyalty world in February when it announced it would adopt a revenue-based model for 2015, showed significant improvement in award seat availability in the 2014 survey. While tying for the Number 16 slot overall, reward seat availability on 55% of its flights represented an 18.6 point increase over the 36.4% availability in the 2013 survey and is more than double the airline's 27.1% availability in the 2012 and 2011 surveys. "We're investing in one-way [awards], we’re investing in more seats, we’re investing in more tiers so more opportunity” to book award seats, Karen Zachary, Delta's Managing Director of Global Programs, told TheTravelPro at the 2014 Freddie Awards. Making more seats available is an important facet of the changes to the SkyMiles® program because Delta has not historically been regarded as particularly generous in terms of the saver seats it makes available, she noted. The survey showed that value-based carrier Southwest ranked No. 1 among U.S.-based carriers with reward seats available on 100% of the flights queried. JetBlue (NYSE:JBLU) was the No. 2 U.S. carrier and No. 3 overall with 92.9% availability, up from the 88.6% availability it had last year. United Airlines (NYSE:UAL) continues to be the highest ranked among major U.S. airlines though seat availability continues to slip, as did its ranking: to No. 14 overall in 2014 from No. 8 in 2013. Saver seats through its MileagePlus program were available on 71.4% of flights queried in 2014, down 8.6 points from 80% in 2013 and 87.1% in 2012. Regional carrier Alaska Airlines (NYSE:ALK) was the No. 4-ranked U.S. airline, with 58.6% availability, up slightly from 56.4% availability in 2013 but still off the 59.3% availability in 2012. American Airlines (NASDAQ:AAL) and Delta Air Lines tied for the No. 5 slot domestically with 55% availability. As noted earlier, Delta showed a rather dramatic 18.6 point increase over the 36.4% availability last year, while American's numbers are up 6.4 points from the 48.6% availability it showed in 2013 and 9.3 points above the 45.7% availability in 2012. The annual survey showed overall availability slightly better than last year, with 12 airlines scoring above 80% for 2014 compared to eight airlines above 80% in 2013. If you live outside the U.S. and belong to a frequent flier program, the survey’s results may be even more encouraging. Of the 11 carriers with the 10 highest percentages, only two were U.S.-based. With 99.3% availability, No. 2-ranked Virgin Australia was only 0.7 points behind airberlin's 100% availability. Virgin's availability was up 0.7 points from 2013. AirAsia was No. 4 with 92.1%, up 2.1 points from last year. Brazil's GOL ranked No. 5 at 90.7%, tumbling from the first-place tie it enjoyed last year when its seat availability was 100%. Singapore Airlines ranked No. 6 at 86.4%, Turkish Airlines was No. 7 at 85.7% availability, and new member China Southern ranked No. 8 at 85% availability. 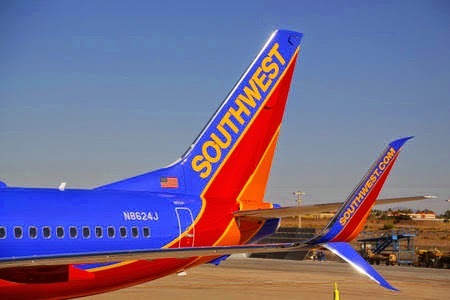 China Southern replaces AirTran in the survey, as the latter continues to be absorbed by its parent Southwest Airlines. Rounding out the top ten slots were Lufthansa/SWISS/Austrian at No. 9 and 82.1%, and Cathay Pacific at No. 10 with 81.4%. 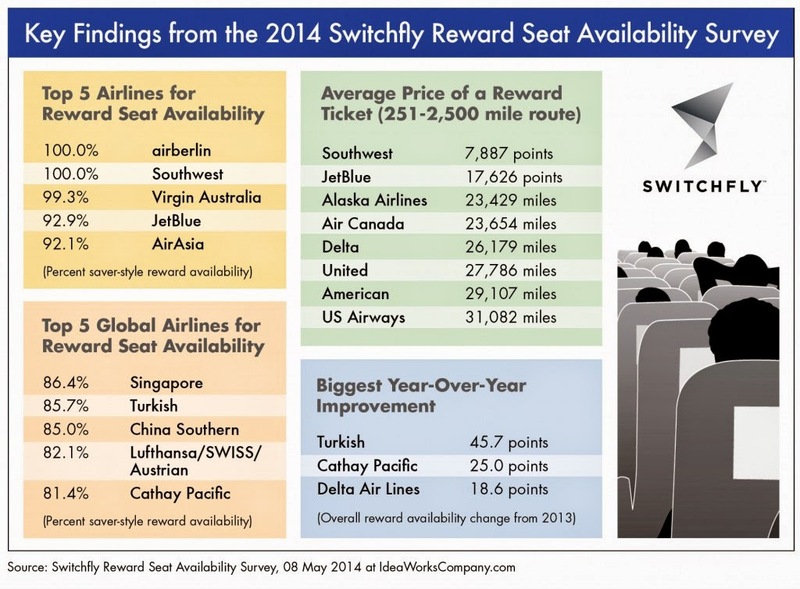 The survey also looked at long-haul flight reward availability and found some very different results. One obvious difference is the absence of value-based carriers from the long-haul markets. Air Canada topped the list of seat availability for long-haul flights of 2,500 miles or more, with seats available on 84.3% of such flights. It was followed by Singapore Airlines (81.4%), Turkish Airlines (75.7%), and China Southern (74.3%), Cathay Pacific (72.9%). The No. 6 slot saw a tie between Lufthansa/SWISS/Austrian and United, which both had 64.3% availability. The No. 7 slot was a three-way tie, with Air China, British Airways and Qantas Group each showing 54.3% long-haul seat availability. While the results of the current survey provide good news for customers frustrated by the lack of reward seat availability, the company noted that "[A]ll this generosity comes at a cost ... and that's the mileage devaluation that budget fare travelers will certainly experience in the future." The following is a chart of the survey's key findings, provided by IdeaWorks. Click on the image to view the chart in full size. I've been exploring for any high quality articles or blog posts on this sort of space . Exploring in Yahoo I eventually stumbled upon this site. Studying this information I am satisfied to express that I have a feeling I discovered exactly what I needed. I no doubt will make certain I don't overlook this website and provide it a look on an ongoing basis.